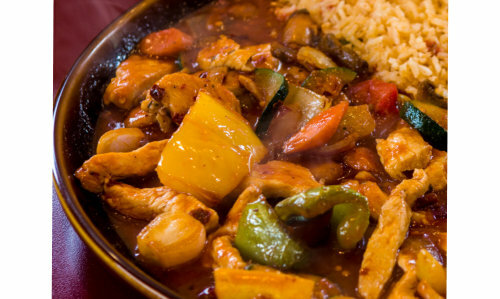 Pollo Mexicano $18.95 Tender Chicken Breast Simmered In A Spicy Hot Ranchera Sauce With Onion And Mushroom. Served With Rice, Beans And Tortillas. 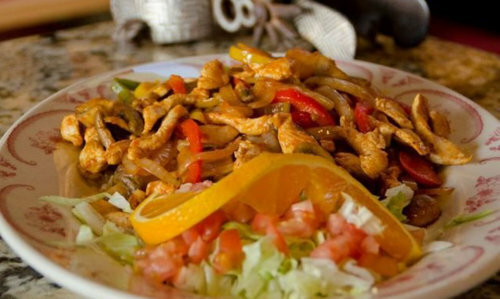 Fajitas De Pollo $18.95 A Traditional Mexican Dish With Boneless Chicken Breast Sautéed With Green Peppers & Onions. Served With Rice, Beans And Tortillas. Carnitas De Pollo $18.95 Boneless Chicken Breast Sautéed With Green Bell Peppers & Onions. Served With Guacamole, Rice And Beans. Arroz Con Pollo $17.95 Here Is A Perfect “All In One” Meal, With Chicken, Rice, And Vegetables Simmered Together. Peruvian Or Mexican Style. Pollo Macho $18.95 Boneless Chicken And Seasonal Vegetables Cooked In Macho Salsa. Served With Rice, Beans & Tortillas (Hot/Spicy). Pollo Fricase $18.95 A Traditional Puerto Rican Dish, Chicken Breast With Tomato, Onion, Potato, Bacon, Green Olives & Capers. Served With White Rice, Pinto Beans & Sweet Plantains. Pollo Con Crema De Coco $18.95 Chicken Breast Sauteed With Onions, Mushrooms And Coconut Cream. Served On A Bed Of White Rice With Sweet Plantains. 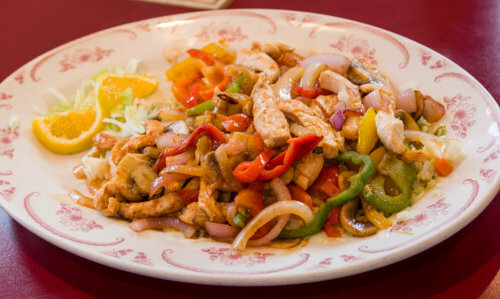 Pollo Ranchero $18.95 Marinated Boneless Chicken Breast, Sautéed In Butter With Onions, Peppers And Spices. Topped With Spanish Sauce And Served With Rice, Beans & Tortillas. Pollo En Mole Sauce $18.95 An Authentic Mexican Dish With Chicken Breast, Slow Cooked In A Delectable Sauce Of Six Different Chilies With Chocolate And Mexican Spices. Served With Rice And Beans. Pollo Asado $18.95 Grilled Chicken Breast With Seasonal Vegetables, Served With Rice & Whole Cooked Beans & Tortillas. Pollo A La Crema $18.95 Chicken Breast Topped With A Delicious Cream Sauce And Seasonal Vegetables, Served With Rice Beans & Tortillas. Pollo Chipotle $18.95 Chicken Breast Simmered With Onions, Bell Peppers & Mushrooms, And Vegetables Then Covered In A Delicious Chipotle Sauce. Served With Rice, Beans & Tortillas.